Day 3 started off very relaxed as we only had a short ride from Sydney, NS to the Fortress of Louisbourg National Historic Site. We had a big breakfast and Zal treated with his winnings from the Casino the evening before...thanks Zalo! The ride from Sydney to Louisbourg only took 30 minutes or so and the road was very good. On top of that, traffic was non-existent! We arrived at the Fortress, paid our fees and caught the shuttle to the historic site. This is another must visit location! The partial restoration of the Fortress is incredible and the attention to period details is very evident, from the timber frame construction to the stone wall restoration to the antique furniture and clothing. Like my post on the Cabot Trail, I will let the pictures tell the story...enjoy! At the prisoner's post in Fortress square! We spent about 3.5 hours touring the Fortress, leave at least that amount of time if you plan on visiting the Fortress. After leaving the the Fortress we proceeded back to Sydney and connected with Nova Scotia Route 4 West on route back to Port Hawkesbury (132km). 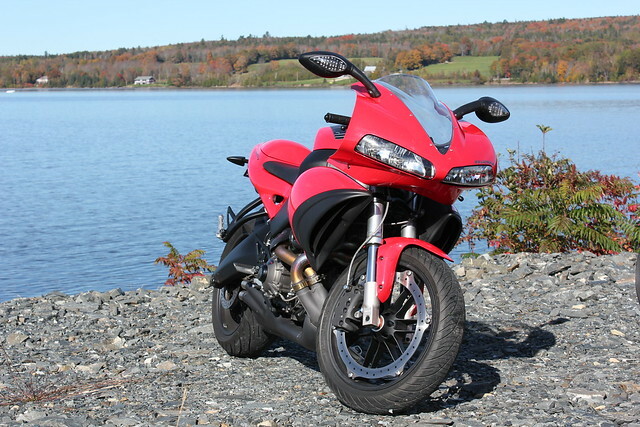 It was a beautiful ride through the Bras d'Or Lake region of Cape Breton. In places the road is very good and in other places it is a bit rough, but I still recommend the ride along Route 4 West. We arrived in Port Hawkesbury around 4:00pm. Our plan was to ride through to Halifax for the evening, but that was about to change. We came to consensus that we would ride as far as New Glasgow, NS and spend the evening and it was a good thing that we did as we were delayed an hour at the Canso causeway! Why were we delayed, cause of this! A submarine on a barge being towed through the causeway...not something you see everyday. The delay was worth it as we enjoyed watching the old decommissioned submarine being towed through the causeway. After traffic cleared, we hit the road for the 100+KM ride to New Glasgow. We arrived at the hotel, ordered take out and settled in for the evening. It was another great day in Nova Scotia.